In the 90s, Japanese TV show Super Sentai was adapted for American audiences, becoming Mighty Morphin Power Rangers. Twenty-odd years after its US debut, you can still take a Buzzfeed quiz to find out which ranger you are. But Super Sentai wasn’t the only Japanese show on TV at the time that featured a team of crime-fighting superheroes. There were also Ultraman, Kamen Rider, and my personal favorite, Soreike! Anpanman. In Soreike! Anpanman (which means Let’s Go! Anpanman), all the heroes are made of bread. As in, each one starts as dough and comes to life in the oven. The titular character’s name literally means Red-Bean Bread Man. If you’ve ever eaten his namesake, you know that whatever his morals may be, he certainly tastes good. Anpanman’s two main partners are Karepanman (Curry-Bread Man) and Shokupanman (White-Bread Man). Karepanman is the grouch, and Shokupanman is the handsome if boring gentleman. We could talk about the typecasting happening here, but in the end, I think we can all agree that a deep-fried curry roll is much tastier than Wonder Bread, so Karepanman wins that round. Every crime-fighter needs someone on the ground for support. For our bread friends, it’s Jamu Ojisan, or Uncle Jam. Whenever a member of team pastry gets injured, Jamu Ojisan—along with his assistant, Batako-san (Miss Butter), and her dog, Chiizu (Cheese)—is ready to bake a new head. When the fresh-baked head comes out of the oven, the old one pops off, the new eyes open, and our hero is good as new. Wherever memories are stored in this universe, it must not be in the brain. Or the bean-paste glob, as the case may be. But how are Anpanman and gang getting injured in the first place? Their enemies are bacteria, namely Baikinman (Germ Man) and Dokinchan (whose name doesn’t mean anything in particular). Leading an army of Kabi (Mold), they eat away at our yeasty rangers. Unlike Lord Zedd, et al, of Power Rangers, the bad guys on this show are arguably cuter and more charming than the good ones. Dokinchan has a Helga-for-Arnold-level crush on Shokupanman, for example. If only Shakespeare had realized the untapped potential of the bread-mold metaphor for doomed romance. If you think this seems like an unusually large cast for a show, you're correct. Soreike! 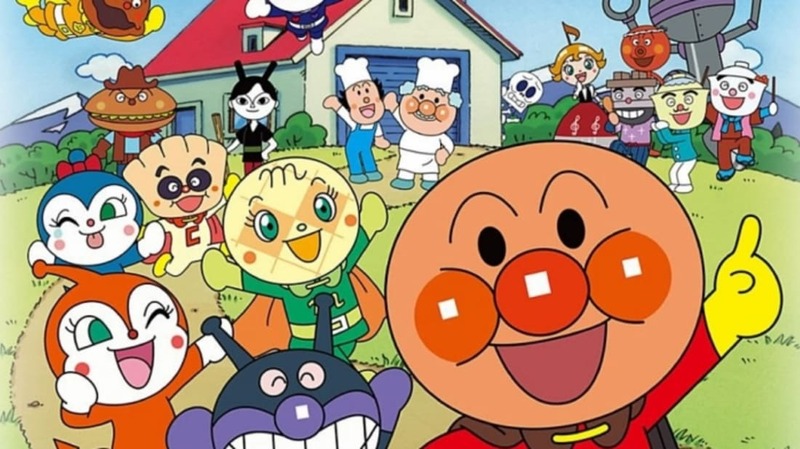 Anpanman, which has been running continuously in Japan since 1988, holds the Guinness World Record for Most Characters in an Animated Series—as of June 2009, the show had featured 1768 characters, good and bad. Some argue that Soreike! Anpanman is an example of Shinto influence on Japanese culture because in Shinto philosophy, all things have a sacred essence, even inanimate objects. One of the best examples of Shinto belief in international culture recently is Marie Kondo’s bestseller The Life-Changing Magic of Tidying Up, in which Kondo, a former “shrine maiden,” suggests thanking your belongings each day. Talking inanimate objects alone aren’t a good enough argument for Shinto influence, since Americans also have characters like Meatwad. But Anpanman’s origin story makes a more convincing case. It starts on a regular night for Jamu Ojisan, who has just put a tray of anpan (the edible and presumably non-living kind) in the oven when a meteor shower strikes across the sky and a group of shooting stars fall into the bakery’s chimney, which leads straight to the oven. Jamu Ojisan and Batakosan clutch each other as lights flash and the bakery shakes. But then the chaos clears, and a baby with an anpan for a head comes floating out of the oven. “The stars brought him to life!” says Jamu Ojisan. Japanese folklore is full of stories like this, from Kaguyahime (which was made into a Ghibli film in 2013), the baby girl found in a bamboo stalk by an old man, to Momotaro, the baby boy found by an old woman as he floated down the river in a peach. As fluffy a show as Anpanman is, it’s also full of these small moments that capture important intangibles about Japanese culture. And along with Ultraman and Godzilla, it taught my brothers and me our Japanese. We’d watch it on VHS while eating anpan and karepan fresh from the bakery down the street. Is that sick? Probably. But it was also delicious.